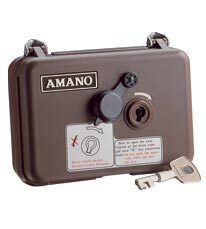 The Amano PR-600 Watchman Clock utilizes clear, accurate registration of watchman's patrol records, ensuring protection of your property and facility. It is very simple to use, lightweight and easy to carry. Complete standalone system requires no computer. Battery operated. Shoulder strap not included. Restricts access to record tape and time by use of a master key. Documents each opening of a recorder by master key with "K" imprint on tape. Documents opening and closing of recorder with "O" imprint on tape. Registers each watchman's ID prior to each patrol route. Self-contained dry cell battery, requires no winding. Designed for maximum protection against possible mishandling. Available lock box prevents station key loss. Assures security is thorough and in compliance with required routes. Dimensions: 6.7"W x 4.6"H x 2.4"D.
Tape length: 12M / roll, 2000 imprints. Box of Paper Tape, box of ten rolls.